Grain Storage? I think not. On a recent business trip to Manhattan, KS, a grain storage bin caught my eye. 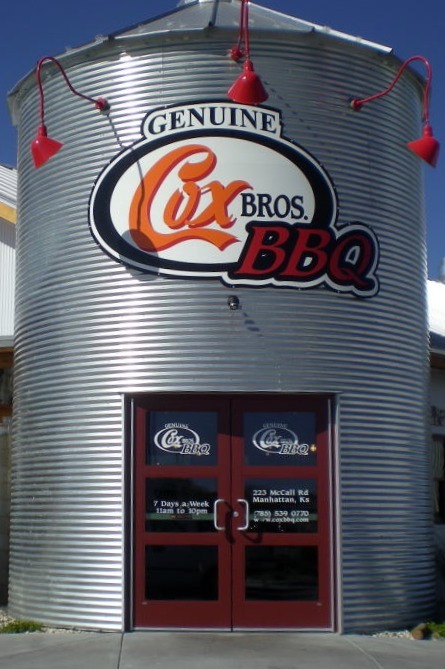 Not because grain storage bins are unusual in Kansas, but because this one happened to be in a busy part of town and connected to a restaurant. This architecture is very similar what is commonly used by the franchise barbeque chain Bandana’s Bar-B-Q located in Missouri, Iowa and Illinois. To my surprise, the new place was not another Bandana’s chain, but a new locally owned Cox Brothers BBQ which has re-opened after being absent from the Manhattan, Kansas restaurant scene for a few years. 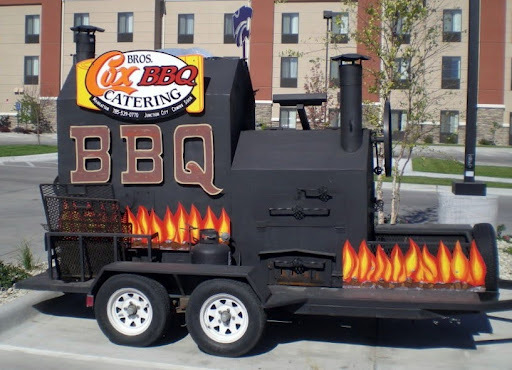 Cox Brothers features several styles of barbeque. You are sure to find one you like. With this in mind, you owe it to yourself to try this place when you are in Manhattan! A new location also recently opened up nearby in Junction City. Cox Brothers Ribs are Rib-A-Licious. I had the opportunity to eat here twice while in town. During my first visit, I thoroughly enjoyed the Big Memphis sandwich, featuring delicious pulled pork along with two other meats on a toasted bun. This was a good sandwich at a good price. I will certainly recommend this one! 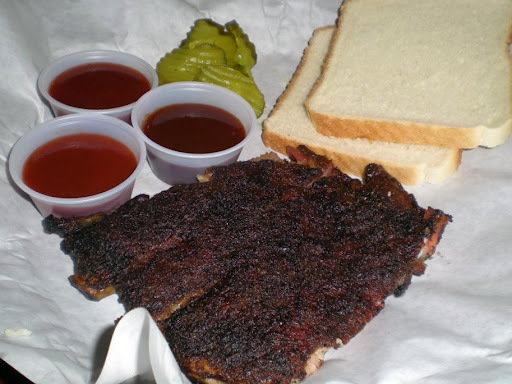 During my second visit, I tried the ribs, which were served up in traditional Kansas City BBQ style with bread, and pickles. Cox Brothers offers four sauces and a variety of rubs for purchase along with a selection of shirts and caps. Speaking of caps, this place is a cap collectors dream. 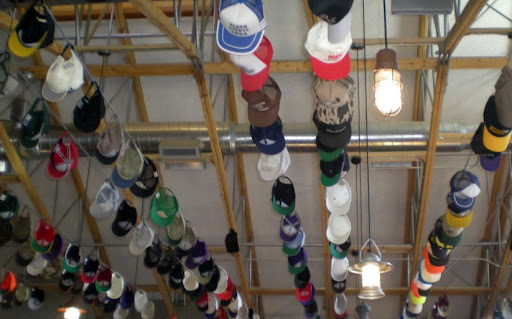 Hundreds of caps from countless locations decorate the ceiling. The friendly wait staff indicated that the owners, Bud and Bob Cox thought this would be a fun and unique decorating idea. They will gladly display your cap, should you choose to donate it to the collection. On another note, who wants some free stuff? Yeah, that’s right free. Below you will see this week’s giveaways provided by the Kansas Pork Association. Answer the question below for a chance to win. We will randomly choose one person from the comments below by 7:00 pm today. Please make sure to provide your email so we can contact you for shipping reasons. 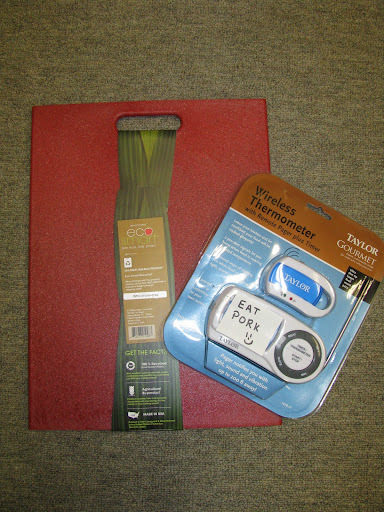 The giveaway is includes: (1) A Taylor Gourmet Wireless Thermometer. This is the perfect little gadget for the person on the go. Whether you’re chasing a few kids around the house or just really focusing on that NFL game, you can be sure to benefit from it. The thermometer includes a remote pager that notifies you with light, sound and vibration up to 200 ft. away from your kitchen. (2) A Architec EcoSmart Cutting Board. Use this cutting board to prep a great recipe like stir-fried pork. Question: When roasting a large cuts of pork, like a pork roast, at what temperature should you remove the cut from the oven or grill to ensure that the meat is not overcooked? – Until next time, Swine and dine! Thanks for all your feedback guys! The answer that we were looking for was 150° F. At this temp the large pork cut/roast should be removed from the oven or grill and allowed to rest for 10 minutes before slicing. We suggest you cover it while it rests. The temperature of the cut/roast will continue to rise to 160° and the pork juices will redistribute throughout the cut/roast before slicing, making it oh-so-much-more-delicious. Pork today is very lean and shouldn’t be overcooked. See the Pork Cooking Time Chart at http://www.theotherwhitemeat.com/Resources/Images/2924.pdf for more info about cooking pork to the correct internal temperature. A few of you got really close but no one really nailed it. So Plan B. After strategically placing your names in a hat and choosing one. The winner is Alice Lemon!Congratulations Alice! Can you contact our partner in crime at the Pork Association at jodit@kspork.org. She will send out your gift tomorrow! Well I'll be sure to open my email earlier next time! You should give us a few days to answer. Your blog makes me drool. @AnonymousWe appreciate the drool and we think it's a great idea to give you guys a few days to answer! We'll have another giveaway in a few weeks and give you guys a bit more time! Glad you received the gifts Alice. Looks like your ready to swine and dine too!